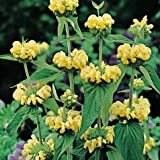 Phlomis fruticosa growing shrub‎ of the genus Phlomis also known as Jerusalem sage, Phlomis fruticosa perennial evergreen used as ornamental fragrant drought tolerant plant, can grow in mediterranean, subtropics, temperate climate and growing in hardiness zone 7-11. Leaves fragrant color green to gray in oval shape. 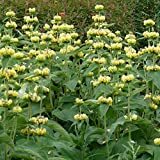 Flower fragrant color yellow in mouth shape big petals down and above smaller the flowers grow in clusters and create round shape like round flower. 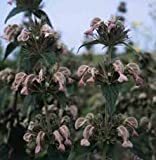 30 Seeds of Perennial Phlomis russeliana - Hardy Jerusalem Sage. Clusters of hooded pale yellow flowers in multiple tiers!